Do I Need GhostScript When I Convert a PDF? We recently received this question from a ReaConverter user who tried to convert a PDF document into an AI (Adobe Illustrator) image format and was slightly puzzled by a message that popped up before conversion, saying GhostScript is required. He also mentioned a GhostScript driver was already installed on his computer, so he couldn’t figure out why the conversion wouldn’t work. If you’re a non-techie and have not come across such messages before, GhostScript might seem to be part of a foreign language. So here is why I have put up a short “translation” – a quick review of what this package of software is, as well as when you might need it and how to use it with ReaConverter. GhostScript is a bundle of software that functions as an interpreter to PostScript and PDF files. Installing it allows you to view such files and print them on printers that otherwise can’t read PostScript files. 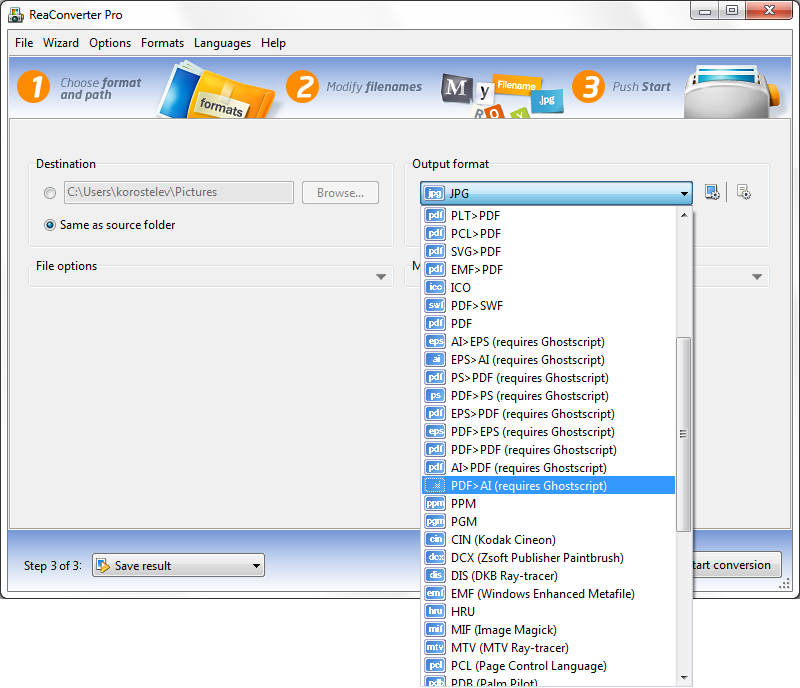 ReaConverter allows regular PDF and AI conversions to JPG or other raster formats. Moreover, it supports vector to vector conversion of PostScript files, which can be used when you convert files such PDF, EPS, AI, PS and EPI in PostScript format. This feature implies a direct conversion, which means input files can’t be edited and the loading settings do not influence the conversion. Though ReaConverter does not require additional software for converting PostScript files, when you want to convert such files into PostScript format, you will need to have the GhostScript driver installed. This is quick and easy to do from this location: http://www.reasoft.com/downloads/ghostscript.exe. You should download and install it from this address even if you might have installed GhostScript in the past on your computer, because ReaConverter does not work with other GhostScript drivers. So, going back to the question from the title of this post, the answer is the following: You don’t need a Ghostscript driver installed when you use ReaConverter for converting files such as AI, EPS, PS or PDF. A designated version of GhostScript is only required if you want to save your output files in PostScript format. Advanced users can do the same using command line utility in manual, automated or scheduled mode. You are welcome to contact our technical support when you have any questions about reaConverter. This entry was posted in Document conversion, Vector conversion and tagged ai, converter, epi, eps, ghostscript, pdf, postscript, ps on December 26, 2012 by reaconverter.